Intel launched its Hades Canyon NUC machines back at CES 2018 in early January. As we are still waiting rather impatiently for their availability we welcomed some gaming benchmark leaks from South Korea a fortnight ago. 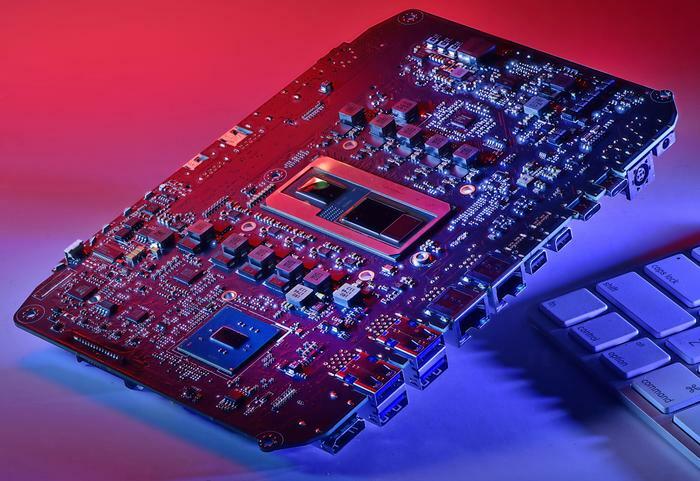 Now Intel has shared a little more official info about its upcoming VR-capable NUCs via the art of photography - it has published a close-up photo of the Hades Canyon motherboard. Above you can see Intel's motherboard picture in its full glory. I've embedded the full sized image (click to zoom in) behind the 700px preview. 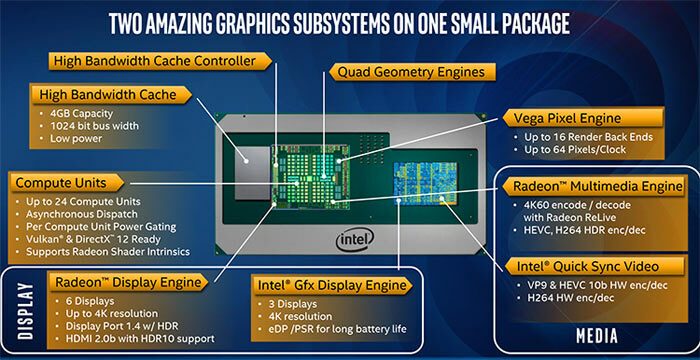 Considering what you see before you the characteristic shape of the Intel Core i7-8XXX-G processor with Radeon Vega graphics is the dominant component in size. You can also see the details of many other chips and components. As a reminder of what you will get when you buy one of the two Hades Canyon NUC machines, you can look at our launch day article. For those that concentrate on the tech specs a table is embedded below for your convenience. In brief, the NUC8i7HVK is based on an unlocked Intel Core i7 8809 G (4C / 8T / max 4.20GHz) with Radeon RX Vega M GH graphics. 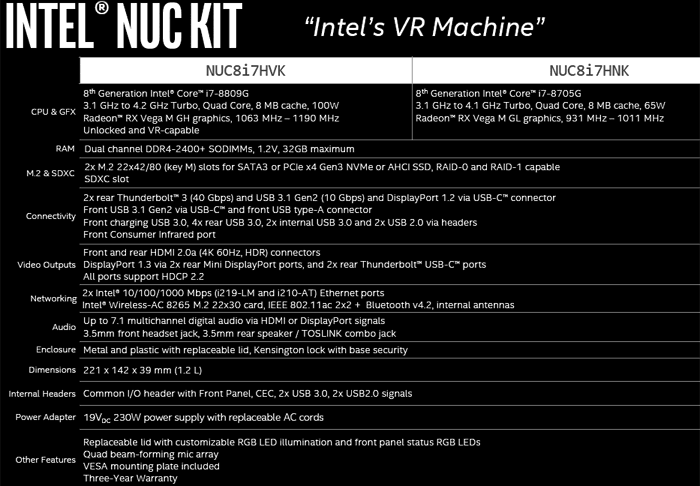 Meanwhile the NUC8i7HNK uses the Intel Core i7 - 8705 G (4C / 8T / max 4.10GHz) with Radeon RX Vega M GL graphics. Both machines feature two DDR4-2400+ SODIMM slots, 2x M.2 storage slots, and an abundance of I/O and connectivity options for a 1.2 litre system. Intel will release the NUC8i7HVK and NUC8i7HNK in Spring 2018, priced at around US$940 and US$770 respectively. Impressive, would like to see more about what AMD are going to fight back with in the near future! is the XBOX X APU graphics engine faster than this?